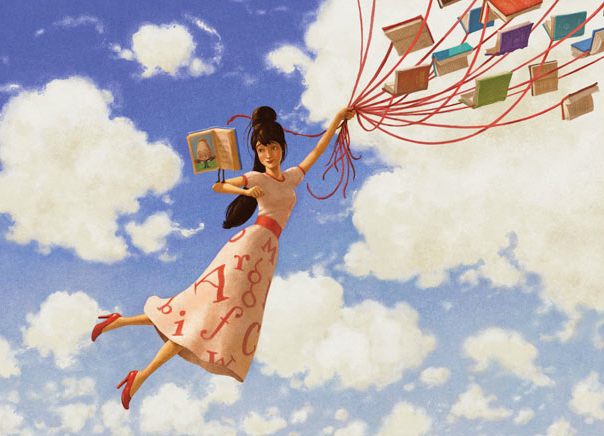 I don’t know how I stumbled upon The Fantastic Flying Books of Mr. Morris Lessmore. I think I ordered it as a present based on an Amazon.com recommendation. However it happened, the book made its way into our home and quickly became a classic. Okay, it’s my classic. Something about the story just spoke to me the first time I read it. Maybe because it’s about books and this rather lonesome figure, Morris Lessmore, who wants to read and write all day. 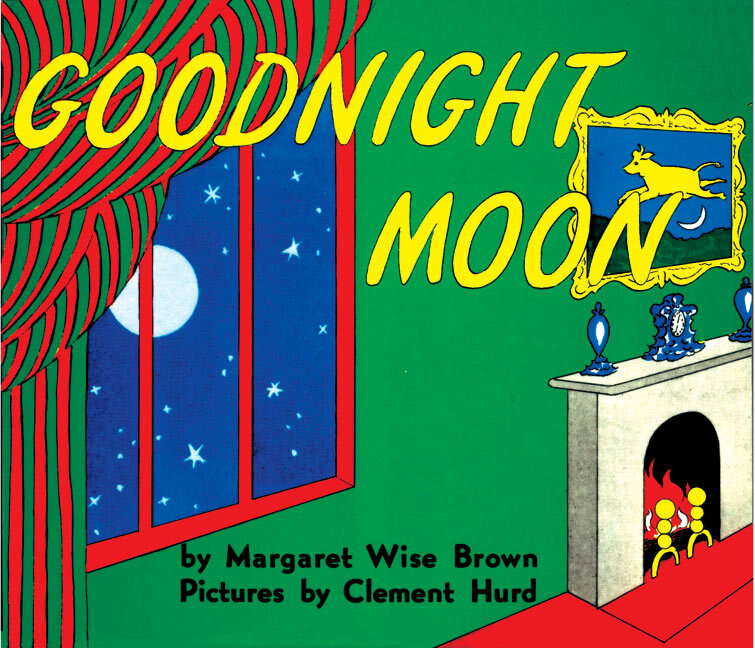 I was enthralled by the text the first time I read it and continue to be every time we pick it up at storytime. Morris Lessmore might not be my childrens’ favorite, however. There is plenty of competition in our house. As long as Waldo keeps getting himself lost in Medieval battle scenes, Brother and Sister Bear remain afraid of the sitter, dentist, and bad dreams, and the hungry caterpillar keeps eating, it’s impossible to name a true #1 in our house. Any book’s reign is short-lived. I’ve even seen a classic tale get bumped after a few days by cheap Spiderman knockoffs or by something called Pinkalicious. Books, while devoured here, can rarely dominate for long. 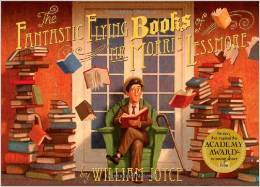 Even so, for me, I’m continually amazed at the brilliance in The Fantastic Flying Books of Mr. Morris Lessmore. 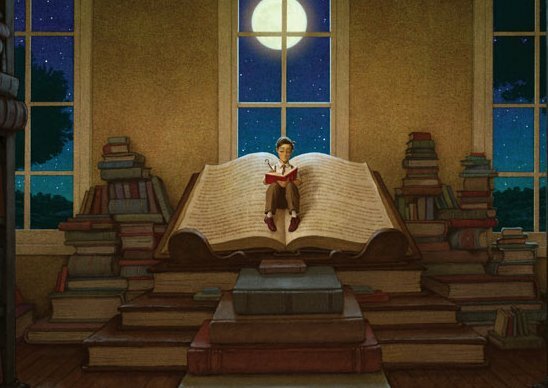 William Joyce’s prose and the brilliantly imaginative graphics by Joe Bluhm create a world where books and their words mean everything. It’s now that Morris decides to leave his world of books and return to his former life. As Morris Lessmore leaves his friends behind at the library, William Joyce indulges his readers with a twist. Morris leaves his own book behind. Like many of us, Morris writes about “his joys and sorrows, all that he knew and everything that he hoped for.” And finally, Morris’s book that he worked on for years starts to fly. Morris has given his story wings and the book takes off. 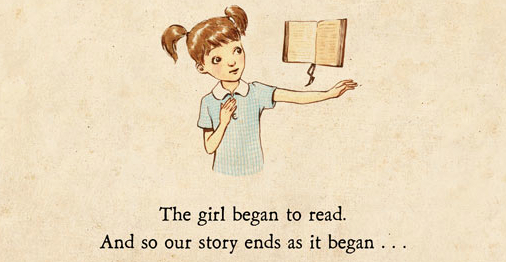 A little girls encounters Morris’s book, opens it, and it’s on the last two pages where Joyce’s story comes full circle: “And so our story ends as it began…with the opening of a book.” I never tire of reading this story as the words, ideas, and images are crafted perfectly–they continually mesmerize me. I find, for some reason, that I can relate to Morris Lessmore’s struggle with words. For much of Morris’s life, his words just never took off. I made a decision a few years ago that I was going to stretch myself personally and professionally and start to write. At times, I feel like Morris Lessmore. Words I write fall flat. Ideas in my head never seem to appear as vividly on my computer screen as they do in my imagination. Like Morris, I sit well into the night hoping that I can capture something interesting with words. Throughout this writing adventure, I’ve had a fair share of disappointment with a bit of success. Like Morris, I think I’ll continue for awhile longer. Like Morris, I write about life and what I’ve experienced. Right now, this means teaching and learning. Will my words ever take flight? I’m not sure, but I’m hopeful. The trailer for the Oscar-winning short film based on the book. Aimee Bender is one of my favorite authors, her fiction is hilarious, and I bet our students would enjoy her. I’m reading her short story collection now.